If you’re looking for exterior deck railing that’s low-maintenance and as beautiful as it is durable, we’ve got you covered. We offer powder-coated aluminum and vinyl railing to accommodate you, whatever your needs. Unlike those other guys, we’re not here to talk you into our most expensive deck railing. 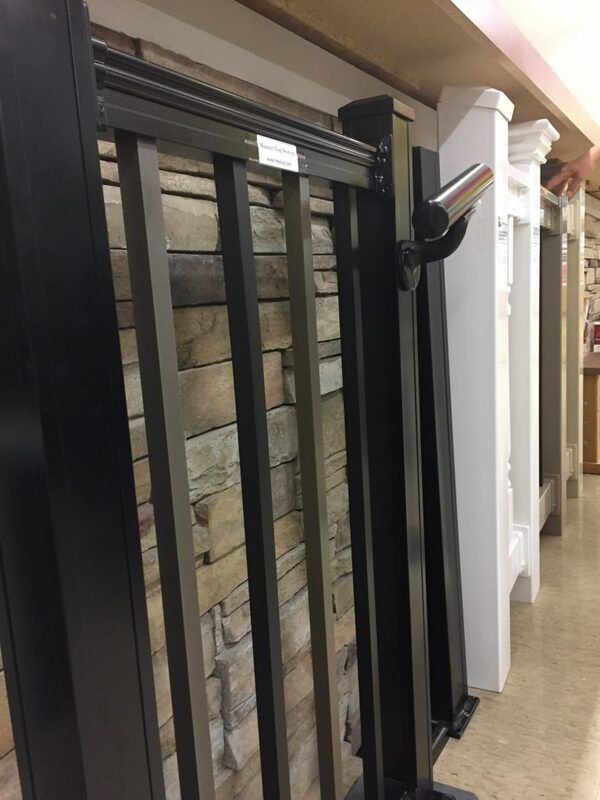 We combine our extensive knowledge with real-life experience and work directly with you to find the deck railing option that fits your project budget, timeline, and taste. We’ll talk you through a number of options for your rail design, including the pros and cons for each option available for what’s in the store as well as what’s available to order. The possibilities for creating the look you want are truly endless with the extensive deck railing options we carry. Choose among different railing materials, colors, finishes, baluster styles and cap designs. Like any other wooden structure, real wood deck railing is more susceptible over time to weathering and parasite damage. Repair and replace less often. No more deck rail staining! A larger variety of styles and combinations to choose from. Colors and styles for everyone! No termites or carpenter bees are getting into THIS stuff. In the past, powder-coated aluminum could be quite expensive. These days, the cost comparison is virtually negligible when compared to vinyl. So why choose aluminum over vinyl? It’s a sleeker, thinner, easier-to-clean option you no longer have to break the bank to buy. Metal railings do not collect mold or mildew. While mold and mildew will collect on aluminum and especially vinyl railing, clean up is a snap and it will not shorten the lifetime of the product as it will with wood. If this is a primary concern, you might consider choosing powder-coated aluminum rather than vinyl when selecting your deck railing, as it’s the least likely to show mold and mildew. Provide us with your specific border dimensions. We’ll guide you through the various deck railing options to help select the right choice for you. 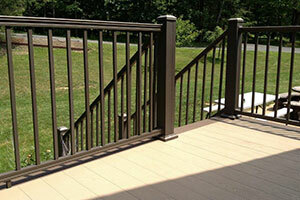 We provide same-day delivery for deck railing materials that are in stock at the time of purchase. For special orders, delivery may take up to 48 hours.